Some of those shoes are incredible, not just the boots. I like the website too, but it is hard to discern some of the colours without an enlarged picture. Just my two cents on the sizing conversation. It also has a lot to do with the type of leather. I just purchased an incredibly soft pair of sheepskin side-zips. They're very tight, but will likely stretch a size or two. The more stiff leathers obviously won't give as much. Guidi's are notoriously narrow. Which will grow. However, if they're too short in the length, it's probably not going to be a good fit. If you are able to source the backzips in horse leather from a season (or two?) back, get them. They have a slimmer silhouette - if slim is your thing - than a number of backzips currently on release. The silhouette is comparable to the sheepskin sidezips pictured up above but maybe a touch more elegant. Not as chunky looking as the donkeys @ Atelier. Plus, nothing moulds better to your feet than horse leather - donkeys come close - and they don't stretch out crazy like some of the other leathers (eg. sheepskin). I've also found that the thick sensuous horizontal folds or wrinkles that form around the upper vamp, which is a common and desirable attribute of guidi boots after frequent wear, come out the best and most well-formed with horse leather - if indeed you desire that sort of thing. That's good and useful info....thanks Todestrieb! [QUOTE=Faust;197862]I would like for peeps to file more reports on the back zips here. What leather, height, you have, how has been the experience wearing them etc. Tried on a pair of donkeys today (had to size up 2 sizes), and they did not feel comfortable, but I was told that the donkeys will stretch in time and than they will be comfortable donkeys. I liked the look, but the shaft was too narrow to tuck my slimmest pants in. Is cropped pants the only option? An option you may want to try is folding down some of that top portion of the boot, so that your pants have a place to hit instead of tuck into. Any narrow trouser or jean will work. Scrunch up the bottoms of your pant legs so they stack on top of the boot, basically. I like the way that looks, but I also think it requires the slightly taller boot as well as pretty shrinkwrapped trousers to look right. ^ Yes, you'd require the taller boots or ones with a higher than average shaft to achieve that. Tight or curved seam or J-shaped trousers/jeans will further add to and enhance the seamless stacking wrinkled look. Having physically slim calves is quite possibly a requisite as well. Thank you for the suggestion, but that doesn't work on me. I guess I will make my decision when I get to Paris. just wanted to add my experience with Guidi fit. My first thought before trying them on was that they would never fit my WIDE feet. The store I was at only had one pair in a 43 1/2,(all my other shoes are a 42). When I put them on they were tight but not crazy tight. Instantly, I knew they would be perfect. Now I think a 43 might have been fine but who knows, only the 43 1/2 in stock, not a big deal. As for the shaft, I find mine not that tight at all. Can easily zip and tuck a pair of pants into them (and I don`t have chicken legs), be it lighter weight pants or heavier wool pants on these cold days. For myself, I find CCP boots especially the tornado boots much smaller in this area. It is a real struggle for me to get them zipped let alone tuck pants into them! I`m in the same club as Acid, Bitter & Sad, you really need to try a pair on before you buy them. Regardless, this thread helped me a lot and I hope I can add to that! I didn't try on first, normally 42 and 43 fits perfect. Thanks, they're similar shape, I was trying to hold out for back zips but these were so nice and a great deal. I also just bought these and i think they fit true(ish) to size. I normally wear a 42 and I bought a 42.... i found them tight for the first couple of wears but now they are perfect. 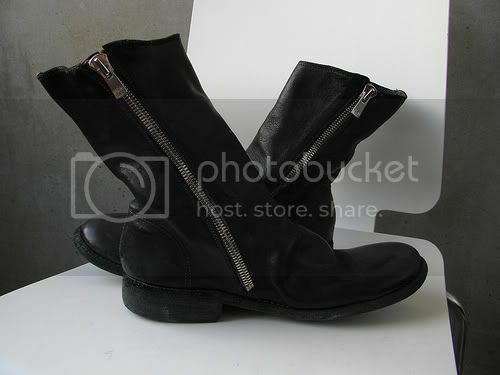 I always assumed guidi were meant to fit like a leather sock and they stretch out to size. I probably could of bought the 42.5 but imo it would take a pretty wide foot to jump 2 full sizes up. agreed they should be tried before purchased. Has anyone exchanged email with marco at pnp recently? I traded some email with him in December, but my last several emails have gone unanswered. Going to see him in half hour. What did you want? ^IIRC, there is new Forme d' on the site, and the F/W stuff was on sale online as recently as a week ago. ^Thanks, I missed it then. It didn't show up in the sales section when I checked.